It is truly amazing how many people from all over the world want to slow down, simplify and get back to the basics of a meaningful lifestyle. Maybe that means planting their first garden. Maybe it means learning how to can or preserve some of their own food to cut out preservatives. Perhaps it might even be learning to raise a few chickens, keep bees, or even make their own furniture. But no matter what the individual reason or reasons may be, one thing is for sure – people want to get rid of the clutter and the craziness to live simple and live better! I know for a fact that is exactly what both Mary and I wanted in the fall of 2010 when we started our own journey. We wanted to grow our own food and create a little space where we could live with less, and yet, have a life full of so much more. When we started the website to document the process, we didn’t realize at the time just how many others wanted that as well. 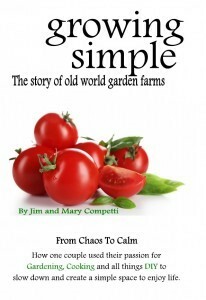 But as we began to share a few of our personal stories of the journey – more and more people wanting to simplify their own life began to follow. And with now over 25,000,000 visitors and 100,000+ followers from 232 countries – it’s pretty apparent to us that people really do want to get back to living simple! As for the book, I have to say it was really quite a thrill to actually receive our first advance promotional copies this past Friday! The ebook version is actually up and now available for purchase at Amazon.com, Barnes & Noble.com, Ibooks, Bookbaby and about 15 other online retailers around the country. For anyone wanting to order the physical book, they will become available for order sometime around the 15th of May on Amazon, Barnes & Noble and other retailers as well. Thanks again to everyone who made sponsored the book project and made it all possible – we could never have done it without all of the incredible support! There we were, just the two of us together on a hot, sweltering summer day in the middle of July, attempting to tear down a hundred-year-old barn – piece by piece. The year was 2011. It was just the previous fall that we had started the journey to create our little farm and homestead. We hadn’t expected to build our farm’s barn until at least the fourth or fifth full summer, but opportunity had knocked in the form of a Craigslist ad. The offer was simple and straightforward – a couple was in need of someone to tear down their old barn to make room for a new driveway and whoever answered the call was more than welcome to haul away all of the precious wooden beams, boards and metal roofing for free! That someone, of course, became Mary and me. 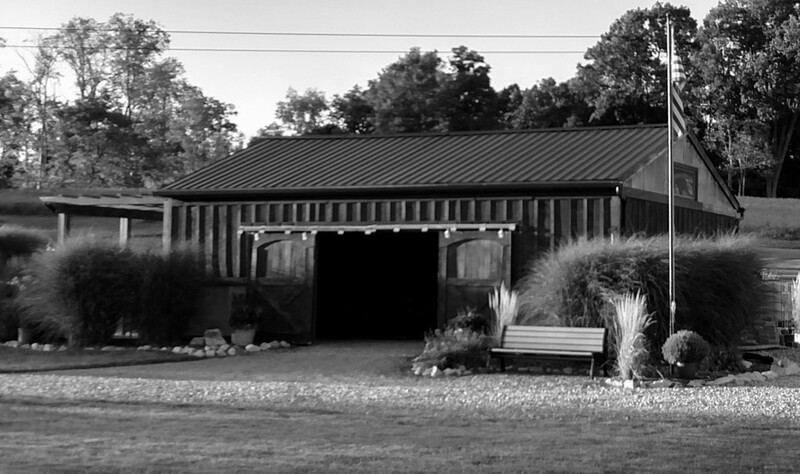 It really didn’t matter that we had no clue how to tear it down or where to begin, we just knew that all of that beautiful old barn wood would be exactly what we needed to build our own farm’s barn – and it was free! We had spent the better part of the first few days removing the barn siding and flooring and by now the barn had been reduced to a beautiful timber frame-like structure. Now it was time to tackle the job we both had put off as long as we could – removing the old metal roof. The plan hatched was simple enough – I would climb up the insanely slippery 30 or so feet to the peak of the old roof, straddle the roof line and remove the top roofing nails. Mary, meanwhile, would remove the bottom set of nails by standing on the highest step of a rickety old wooden stepladder placed safely, of course, on a bed of a borrowed 24’ flatbed truck so she could reach the bottom of the panels. Hopefully, if all went well, the 28 x 16’ long panels would slide down easily one at a time. That was the plan anyway. After what seemed like an eternity to simply work the nails of the first panel loose, I yelled down to Mary to give a pull, fully expecting to see that first sheet of roofing metal slide easily down to the earth below. But after a gentle pull, followed by a stronger tug, the panel wasn’t budging. It seems that people really did build things better and stronger in the old days! So with that we decided that if we perhaps gave a set of really strong pulls together, it would come free and that’s when the real fun began. Okay, I stated, on the count of three….one, two, three!, and we both began to pull. After about 2 seconds of hard pulling I quickly realized I was in big trouble! Stooppp!!! !I bellowed out to Mary below above the crashing noise of corrugated metal bending and twisting. Stoooppppp!!!!!! I screamed again – this time much louder and with a much more convincing fervor. The entire barn was moving, and it wasn’t from a rare Ohio earthquake.As the swaying slowly ceased – I looked down at Mary, clearly showing a little fear in my eyes and lowering my voice from my prior screams, and gently muttered Did you not feel the entire barn moving?Not really, she said laughing. I think she was somewhat proud that she might just have the strength to bring the whole barn down. I, on the other hand, was a little more concerned perched up on top. So I slowly tugged on the metal and the barn once again swayed…͟wow…that’s not good, she said in a very calm matter. 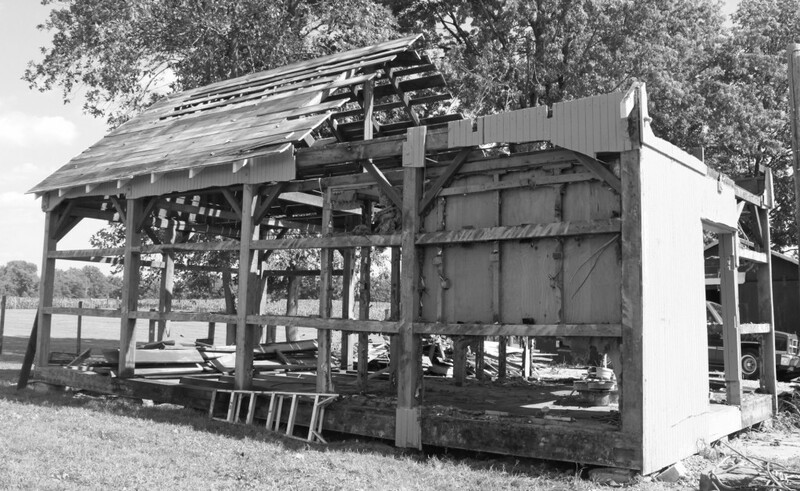 Unfortunately, it seemed that our removing the walls and floorboards did nothing to loosen the metal roof panels but did wonders in making the entire barn structure unstable. Sensing the entire structure would come down with me on top of it if we continued the hard pulling effort we went to plan B. I would cut the panels free of the boards below with a reciprocating saw.It seemed plausible enough and, after Mary had handed up the saw to me, the sharp construction blade on the saw made quick work of the old nails and panel 1 slid to the earth. For a brief moment – and I do mean very brief – we had that momentary, self-congratulating, pat-on-the-back thought of success. We had overcome the problem and were on our way! And then it all changed…. ← How To Use Mulch In The Garden – The Secret To Weed Free Success!